I have a section of my backyard that I want to do something specific with. In the photo I’m attaching you will see a garage and a garden. Behind the dogwood I want to create a little path that runs between the garage and fence and that goes to the very back of the fence where the garage ends. It is about 5 feet across. At the end of the path, at the back end of the fence I was thinking of putting some large patio stones and having a little seating area. This section is under a big old tree and gets lots of shade. I live near Coxwell and Danforth and I believe the earth is a mixture of sand and clay (maybe mostly sand?). I’m wondering if you could suggest some nice shade plants to run along either side of the path as well as some nice ground covers to plant in-between the stones that create the path. Congratulations on your first steps toward a new garden space! The Toronto Master Gardeners are a group of volunteers who educate the public about gardening and horticultural issues. Although we do not offer free gardening design services, we can certainly provide you with a list of a few shade-loving plants that would suit your purposes. 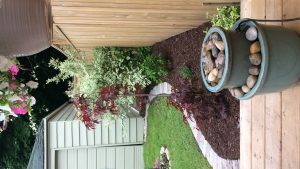 Generally speaking, plants that are considered woodland plants would work well under a shade tree. A biennial option would be foxglove (Digitalis spp). If you plant this from seed, it will produce foliage the first year and flowers the second. It will usually seed itself in the garden and you will end up with plants in future years. If you would like flowers the first year, buying a seedling from a garden centre will result in your desired effect. *These are vigorous growers and may become invasive. Come fall time, you may all want to consider planting bulbs for the following spring. Assuming your big old tree is deciduous, it will not have leafed out during late winter or spring, when these bulbs sprout and bloom. Hence, even bulbs that require full or part sun may grow very well in this location. Enjoy the fun of selecting beautiful plants for your garden! There are certainly a lovely variety for shade at garden centres and from seed sellers and there are new colours and forms being introduced each year.